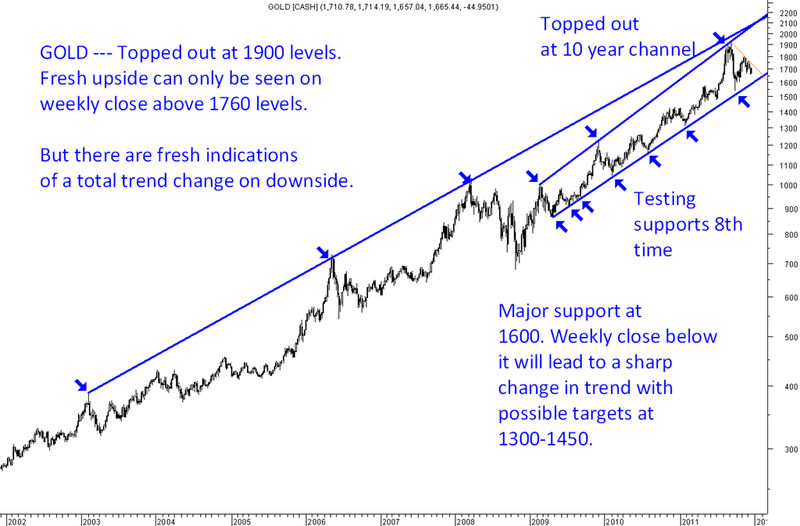 Gold — Long term uptrend under threat. Gold --- Long term uptrend is under threat. basically .. gold chart is varying according to currency u take as base.. it $ term it may look weak .. but if u see re. wise u will feel it is bullish .. The commodities move in their own way. Dollar Index did nothing major last few months but nymex crude did fall to sub 80 levels. So all the co-relations go for a toss. Better to stick with pure technicals on each of them. Gold is giving signals of heading towards a major breakdown. Nifty may or may not go to 4000 but majority of the stocks are already at similar levels. Thanks for the reply nooresh .. ya my above comments were based past correlations which might or might not work .. gud call on gold .. hoping it soon reaches ur 2nd/3rd target too .. Keep the good work going ..
Gold broke the long term support of 1600.